I come from an extended family that was, how can I put this politely?, lively. My dad had more siblings than you could count on one hand and regular (huge) family gatherings were a common thing growing up. When you get that many people together, you need activities to occupy a lot of people. We had a lot of fun, but I wish more party games like these had been around back then because it sure would have helped mix things up a bit! 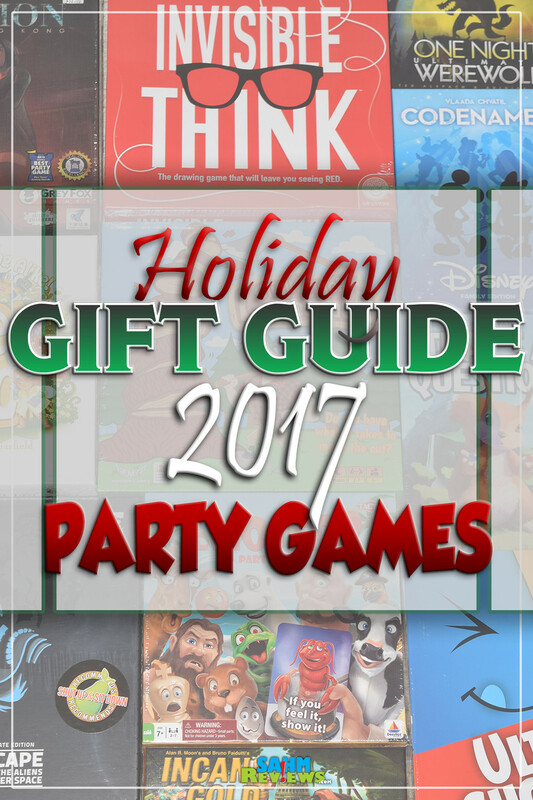 This gift guide lists a variety of party games that range in theme, playing mechanisms and ages and is dramatically different than many of the party games we grew up with. Read over the various descriptions for gift ideas for someone on your list. Of course, you can always purchase one to have as an alternative to cringe-worthy conversations at upcoming holiday gatherings! Admit it… you know exactly what I’m talking about! Check it over and see if anything sounds exciting. Want more information? Click through the logo to see what we thought when we played it. 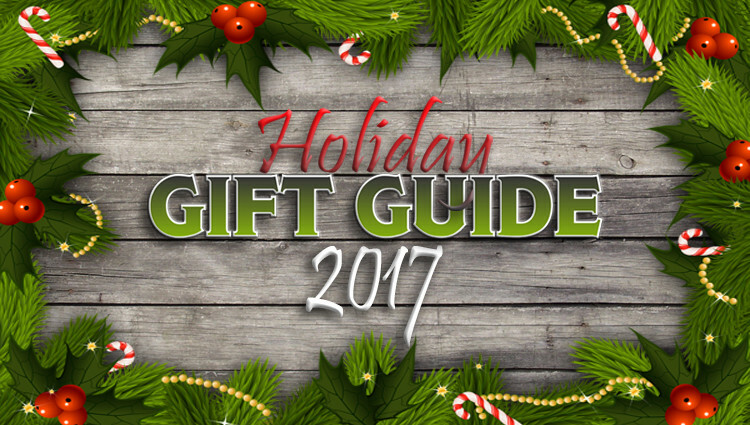 We’ll have multiple guides with a lot of different ideas so be sure to check out the other gift guides too! You can see ideas for games for the family, lots of card games and ideas for toys for little kids. We’ll be rolling out STEM, gift ideas for school-aged kids, games for little kids, ideas for teens and adults as well as household and electronic gift suggestions. Stay tuned! 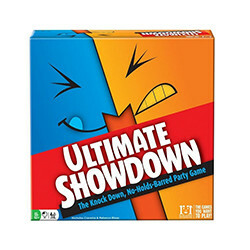 Ultimate Showdown is the no-holds-barred party game that pits famous people and characters in a battle to decide who will be best at a given situation. Will it be Yoda or the Tooth Fairy for best boss? The Easter Bunny or Scooby Doo for best babysitter? With innovative game play and unique bracket scoring, you pick the challenges and try to get your picks to WIN! It’s a murder mystery in a box! 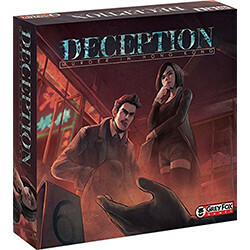 Deception: Murder in Hong Kong puts you into the role of investigators trying to solve a murder. The twist…. one of them secretly IS the murderer. Using clues from a forensic scientist, players will try and figure out who it is and how they did it. Deception: Murder in Hong Kong plays groups of up to 12, so it’s perfect for a party. One Night Ultimate Werewolf is a fast-paced game where everyone gets to be a different role. In the course of only one night and the following morning, the players will determine who among them is a werewolf…hopefully. 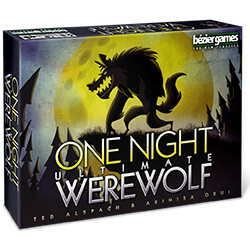 One Night Ultimate Werewolf is a microgame of the party game Ultimate Werewolf that doesn’t need a moderator. There’s no elimination, and each game lasts about 10 minutes. A dexterity game where nine plastic tree segments are stacked up. Each tree segment has four bark sections around it. On their turn, a player gets two taps with the axe to try and knock off pieces of bark from the tree segments for one point a piece. But be careful, if a tree segment comes down it’s minus 5 points! A quick unique dexterity game. 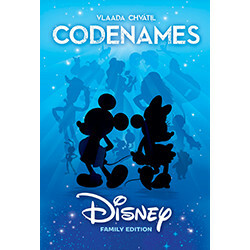 The Disney Family Edition of Codenames combines the hit social word game with some of Disney’s most beloved properties from the past 90 years. Two Cluemasters give one-word clues to help their teammates identify the Disney characters, locations and items from a 16 card game grid. Including both pictures and words, it’s family fun for Disney fans of all ages. That’s a question! 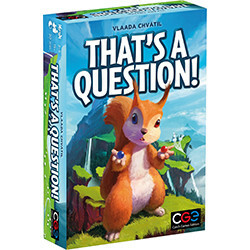 And it’s also the sort of question you’ll need to answer when you play this game. 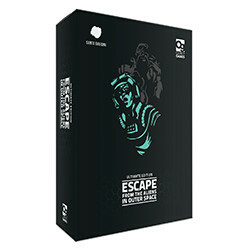 A game of bluff, strategy, and avoiding getting eaten by your friends, Escape from the Aliens in Outer Space is an essential for any collection, but simple enough to appeal to new gamers. 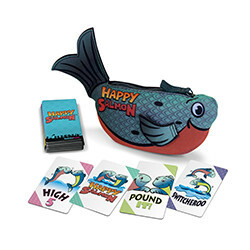 Happy Salmon is the fast-paced card game that gets everyone moving (and laughing) in under two minutes. Players simultaneously call out actions like “High-5”, “Pound It”, “Switcheroo”, and “Happy Salmon.” When two players match, they celebrate by performing the action and discarding their card. The first player to discard of all their cards wins! Combine the Happy Salmon Blue and Green editions for 12 player fun! 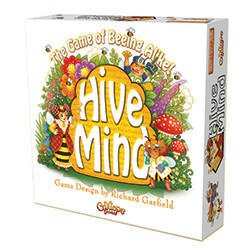 In Hive Mind™, players are bees who ask and answer questions. Each bee is trying to prove they should stay in the hive by predicting the other bees answers. They do this by answering questions the same way as their fellow bees. The more answers they have in common with other players, the more points they get! Bees with the lowest point totals move closer to the hive door. When one or more bees leave the hive, the game is over. The bees remaining in the hive win! Draw a card, read it aloud, and then do what it says… bending your body into ever crazier poses while continuing to draw cards! The harder it gets, the more fun you’re having! Since its creation in 1958, Mad Libs® has become the world’s most popular word game, with over 125 million Mad Libs® in print. And now, Looney Labs has turned it into Mad Libs®: The Game—a party game that captures all the unexpected silliness of classic Mad Libs®. 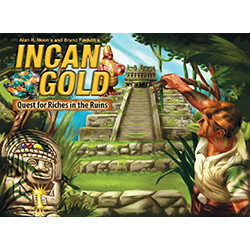 Incan Gold is an award-winning game in which players push their luck as they head into a ruined temple, attempting to find the most jewels. Each turn, a card is turned over that increases the gold found in a temple or shows a hazard. Players can attempt to escape, keeping the loot they’ve acquired, or stay in the temple, hoping for increased profits. As players escape, those in the temple will acquire bigger shares of each pile of gold found, but also run the risk of death if the same hazard card is drawn twice. 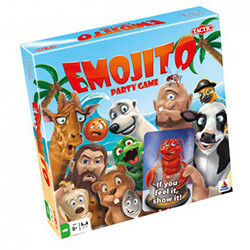 Up to eight people can play this game, so it works very well at parties and other gatherings. 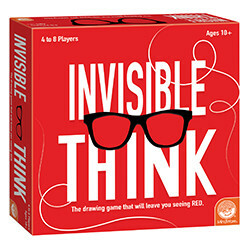 This hilarious party game will bring friends and families together to laugh at the outrageous outcomes of blind drawing. Players take turns racing against time to get their teammates to guess the word on the drawing card. But there’s a twist: either the person drawing or the teammates guessing will wear special red-lensed glasses that make the ink seem invisible! 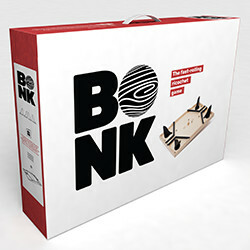 BONK is a two to four player fast rolling ricochet game. The aim of the game is to roll steel balls down your chute so as to knock the wooden ball into your opponent’s goal. BONK demands a good eye, timing, and teamwork. It penalizes both fumbling and trigger-happy play. Hilarity is guaranteed for ages 7 to 107. Fill your life with Boing! House of Boing is the game that mixes speed, dexterity, and fast thinking. The first player to empty his or her room of balls wins! House of Boing features 10 games to wow your next party, including House of Boing, Top Boing, Team Boing, Long Boing, and more. 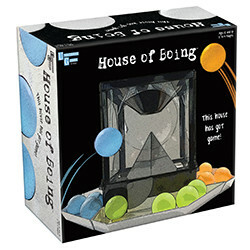 With its elegant design, House of Boing may be enjoyed as a work of art or played as a challenging addition to any game room. For 2 to 4 players, ages 12 and up. 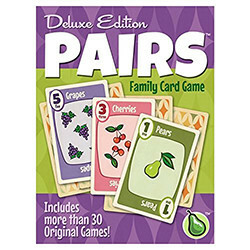 “Pairs” is a new classic pub game! One Pairs deck—55 cards numbered 1 through 10, with 1×1 2×2, 3×3, and so on up to 10×10—can be used to play dozens of games! Deluxe Pairs features a larger, nicer game box, a new retro-style fruit deck, and a rule book with over 30 fan-favorite games and variations! Don’t forget to enter to win some of these in our 150+ Days of Giveaways! We hope you’re able to check at least a couple things off your list thanks to the many gift guides and giveaways we are promoting this holiday season. 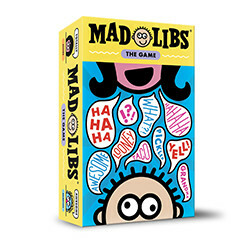 We love Mad Libs but I had no idea there was an actual game with the same name. Adding that one to the family Christmas list! You really gave some great ideas, I think several of these will be under our tree this year, we love games. I want Invisible Think, I had not hear of that before and it sounds super cool! I will have to put it on my wish list this year. 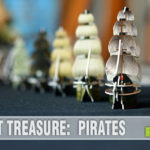 We love family game night and there are some super fun selections on this list. The Disney Family Edition of Codenames is an absolute must. My kids would really enjoy Click Clack Lumberjack. They like playing games with pieces to manipulate. I’ll have to put this on their Christmas list! These are all great ideas! We love board games, so I know I’m going to find some great holiday gifts here. I think we’re going to have to try some new party games when the kids come over this year. I’m liking these suggestions! This is a really great list as we always buy new games to play when the family get together at Christmas. I am going to check some of these out and purchase those that are suitable for all ages. Great guide for families. I loved playing games as a kid. I wish I had a little more time to play now. That is a great compiled list for every game lover. These would make such awesome gifts for the boys in my family! How cool! We love games here and these look like some great ones to look into! These are all awesome picks! I think I will get a few of these games so we can have something new to enjoy during our family game nights. I haven’t even heard of these games, not even on television commercials. Emojito and Deluxe Pairs sound the most fun for this girl. 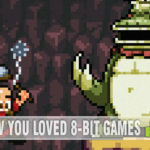 This is a great list of games! 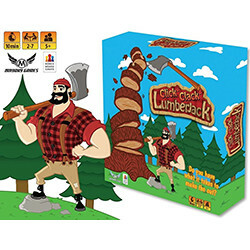 Click Clack Lumberjack and The Ultimate Showdown look like they’d be right up our alley! 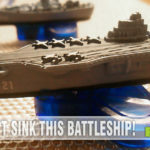 I love the Ultimate Showdown because it is a party game that can bring fun to any family holiday gathering. I think we need to play more board games for the holidays. That’s a Question is one I think my friends and I would enjoy. I’m so glad to see Ad Libs is still around–and oldie but definitely a goodie!! I can see my kids like the That’s A Question game. It sounds fun! I’ve come across the Happy Salmon game a few times, and it always looks like fun. 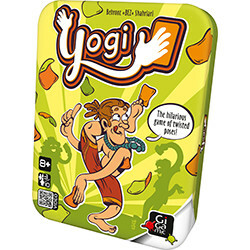 Our family enjoys family game night and we love adding new games to our collection. We have not played this game yet. I would love to win.